Good Sunday morning from Philly, where I took an early-morning walk around Penn's campus, pleasantly enmeshed with the 300-year-old city. Situational awareness: This was the week that suicide was recognized, per the N.Y. Times, as "an intractable public health crisis that has been unfolding in slow motion for a generation." The N.Y. Times says that its Kate Spade obituary was the most read article every day following its publication on Tuesday. The Times obituary of Anthony Bourdain was shared more than 18,000 times on Facebook. Pain and presents: McDonald's and musicians ... President Trump will confront Kim Jong-un using "a strategy to impress as well as intimidate" — and is open to planting a U.S. embassy in North Korea. U.S. officials involved in the summit preparations have even discussed enlisting gymnasts and musicians to bring the cultures together, sources familiar with summit prep tell Jonathan Swan and me. 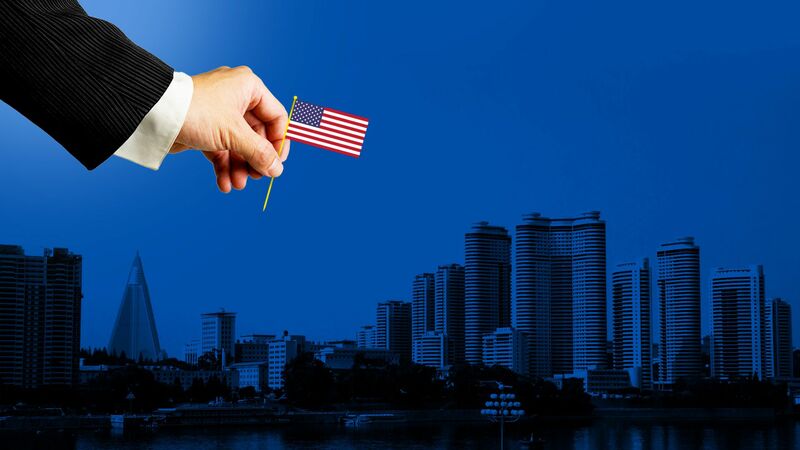 Trump will insist that the price of engagement — and modern relationships and amenities — is the start of a denuclearization process, a source close to the White House told me. It's part of an anything-goes approach that includes, as Swan scooped last night, the possibility of establishing official relations with North Korea and even eventually putting an embassy in Pyongyang. 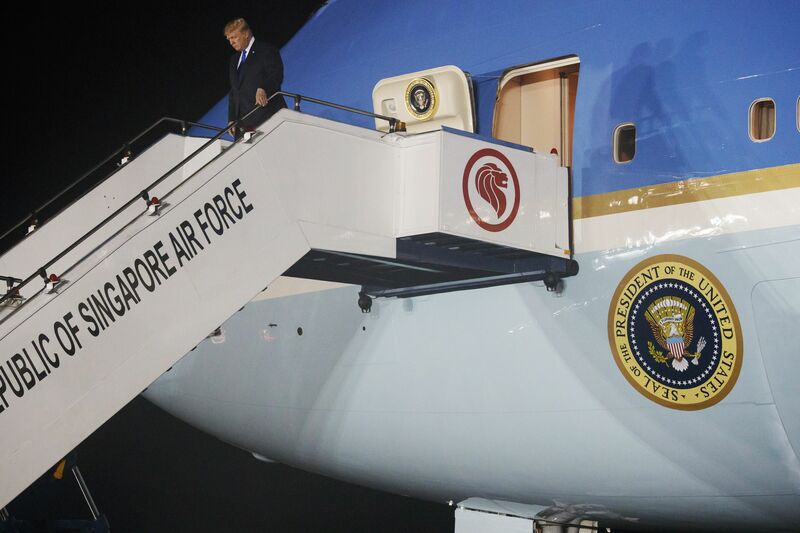 "President Trump emerged from AF1 at 20:30 local time, wearing a blue tie. He gave a wave and walked down the stairs. He was greeted by Singapore delegation at the bottom of the steps ... Asked how was feeling about the summit, POTUS replies 'very good.' At 20:34 the motorcade is rolling." Quote du jour ... Trump at Quebec presser, before leaving G7 summit for Singapore, asked how long it'll take him to know if Kim is serious: "I think within the first minute I’ll know. ... Just my touch, my feel. That’s what I do." 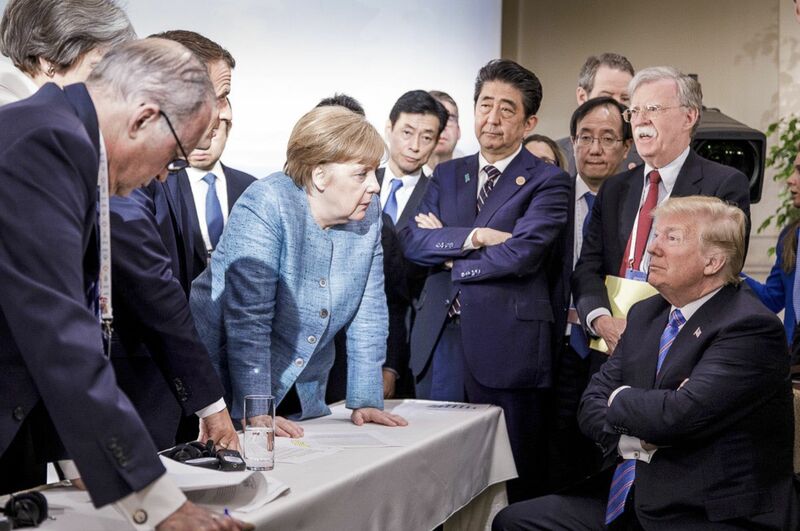 "The picture ... shows a standing Merkel with hands firmly planted on a table staring down at Trump, who is seated with his arms folded and eyes glaring. Japanese Prime Minister Shinzo Abe stands next to Trump as French President Emmanuel Macron leans in next to Merkel." "The photo was tweeted by Merkel spokesman Steffen Seibert. Shortly afterward, the White House issued a photo showing Trump speaking as Merkel, Abe and Canadian Prime Minister Justin Trudeau listen." "Among the president’s ... confidants is Scott Pruitt, the administrator of the Environmental Protection Agency. Mr. Trump has dismissed the advice of several aides who have tried to persuade him to fire Mr. Pruitt in light of the growing questions about misuse of his authority. The two speak frequently, and the president enjoys discussing his negative view of Jeff Sessions, the attorney general, with the embattled E.P.A. leader." Bonus: "People who did not work with Mr. Trump before the White House see his behavior as deteriorating; people who have worked for and with him for years say he has never changed, and there are simply fewer people around giving him a level of cover." 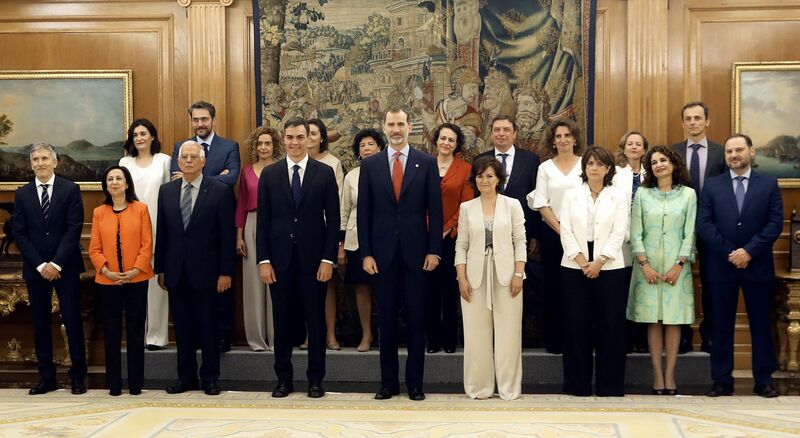 Spain's new socialist prime minister, Pedro Sánchez, named a cabinet with women holding 11 of 17 top posts. 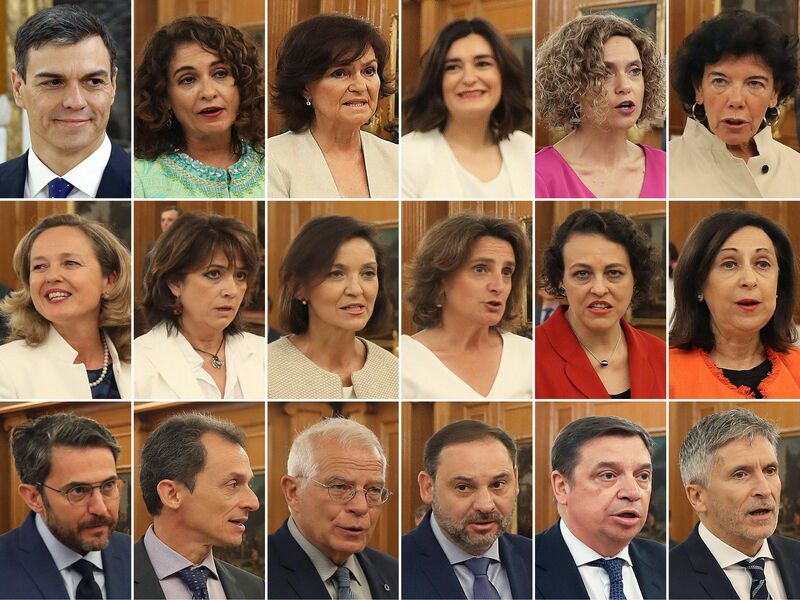 AFP: "That makes it the European government with the highest ratio of female cabinet ministers, ahead of Sweden's, which has 12 women and 11 men." Hat tip: David Lawler's excellent Axios World newsletter. Sign up free. "[W]hen companies pay money or lip service to diversity initiatives but don’t track whether those initiatives work, people start to feel like their time is being wasted." "Attrition of women remains high. And the number of black and Latino tech workers has by some counts actually declined." "When some of Silicon Valley’s biggest names release annual employee demographic data, the numbers tend to budge, at most, by just one or two percentage points. At Apple, underrepresented minorities rose from 22% of the workforce in 2016 to 23% in 2017. The percentage of female workers remained stagnant at 32%. At Facebook, Latino staffers increased from 4% of the workforce in 2016 to 5% in 2017, while black employees moved from 2% to 3%." "The survey of the American Jewish Committee showed 77 percent of Israelis approved of the president's handling of U.S.-Israel relations, while only 34 percent of American Jews did. Fifty-seven percent of U.S. Jews disapproved, while only 10 percent of Israelis did." Roger Bennett, co-host of NBC Sports’ "Men in Blazers": "[T]he sport’s history in the United States has been complicated — a spectacular story of bold predictions, booms and busts, in which soccer has forever been hailed as America’s 'game of the future' ... America, for so long soccer’s final frontier, has quietly become a true epicenter of the game. Since the United States hosted the tournament in 1994, the sport’s rise has been steady and inexorable, World Cup to World Cup. ... Americans bought more tickets to [the World Cup] than any other nation except Russia, the host, even though the U.S. team didn’t qualify." Andrés Martinez of the Walter Cronkite School of Journalism and Mass Communication at Arizona State University: "Soccer is the perfect cosmopolitan antidote to Donald Trump ... An answer to the isolationism and xenophobia sweeping the United States." Thanks for reading. Coverage all day on Axios.com.